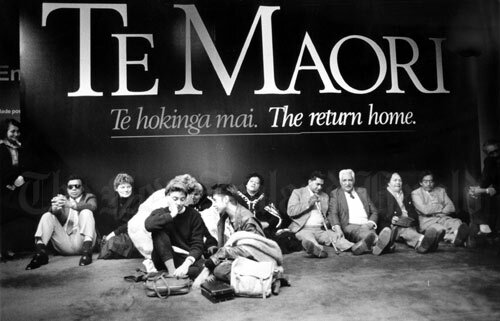 The Te Māori exhibition was a milestone in the Māori cultural renaissance of the 1970s onwards. Featuring traditional Māori artwork, the exhibition at first toured the United States in 1984 and was shown in New York, St Louis, Chicago and San Francisco. It was a great success and returned to tour New Zealand, again to applause, and a swelling of Māori pride. This photograph shows exhibition staff at the Auckland City Art Gallery just before its opening there.